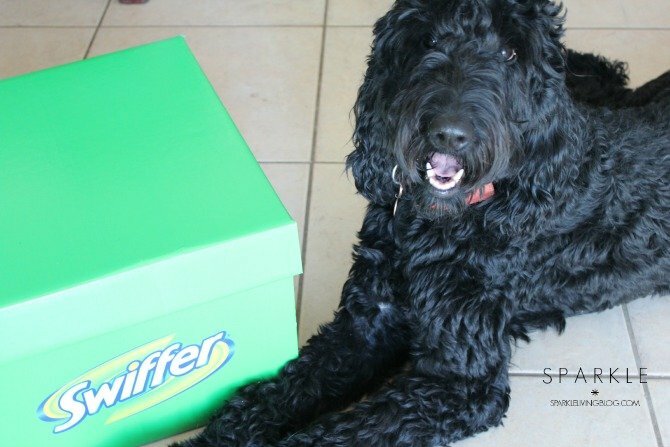 Spreading the #SwifferEffect to pet owners… with the Big Green Box! Swiffer® was kind enough to send a giant green box full of products to help promote Swiffer® is supporting the American Society for the Prevention of Cruelty to Animals® (ASPCA) in a year-long effort to help find homes for animals in need and help make the challenges of cleaning up after a pet less of a concern after adoption. Read more about that here. Each one of these guys is amazing and has made their own special mark on the family and in our hearts. Meet Jonesy. He’s so good and loved posing with his giant green Swiffer® box! Jonesy is the sweetest labradoodle of all time. We adopted Jonesy when he was seven months old from a lady who was sick and couldn’t keep him anymore, she assured us that he was healthy and provided us with his immunization records. Little did we know, he wasn’t immunized at the right age, and he wasn’t fully protected. Even worse, is that he was already sick. The first two days with Jonesy was amazing. He was sweet and listened and barked when the girls danced. But then he stopped eating. I thought it was stress from being in a new home with a new family, but then he got sick. The kind of sick that you don’t want to hear about. I rushed him to the emergency veterinary hospital and it turned out he had parvovirus. He had to be admitted into the doggy ICU for fluids and antibiotics and isolation from other animals. The vet said there was a good chance that Jonesy wouldn’t survive. 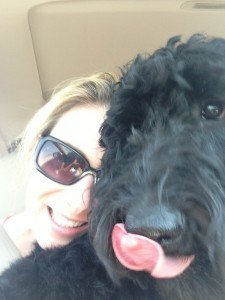 Three days passed with Jonesy in the doggy ICU. They wouldn’t let me visit him, due to the isolation precautions, and they told me that he wasn’t improving much. At this point, I had spent nearly $5000 on a dog I had owned less than a week. 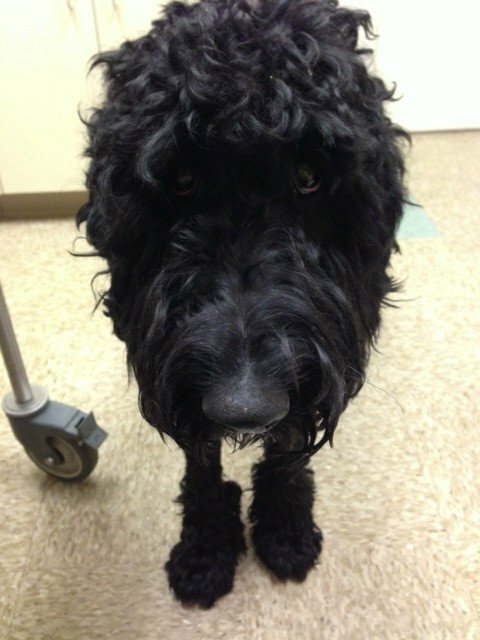 I told the vet that I’m an ER nurse and if they would send me home with supplies I would care for him at home. It was a big decision, but I felt comfortable. I set turned my master bathroom into a doggy ICU. Caring for him was an around the clock ordeal. He had to get fluid boluses, medications, oral fluid challenges to see if he could hold down water, and be cleaned then cleaned again. The bathroom had to be cleaned with bleach multiple times a day. I had nurse friends come over when the Mr and I were at work, to care for him. Slowly he improved. One day I came home and he had his front paws up on the gate, with the best smile I’ve ever seen. We had healed him. Most labradoodles and goldendoodles don’t shed much, and Jonesy doesn’t much, but after being so sick a lot of Jonesy’s fur was coming out. Wanna know what I think is the easiest way to get fur off the floor? Use a Swiffer®! The dry Swiffer® Sweeper picks up any hair, dust and dander in one fell swoop. 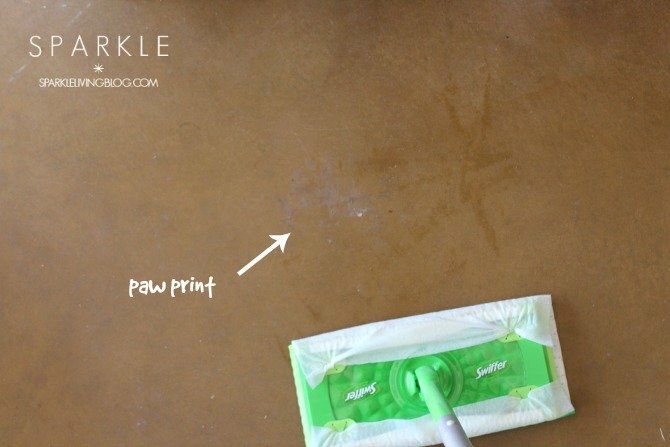 The Swiffer® Wet Mop is perfect for those muddy paw prints on tile or concrete. 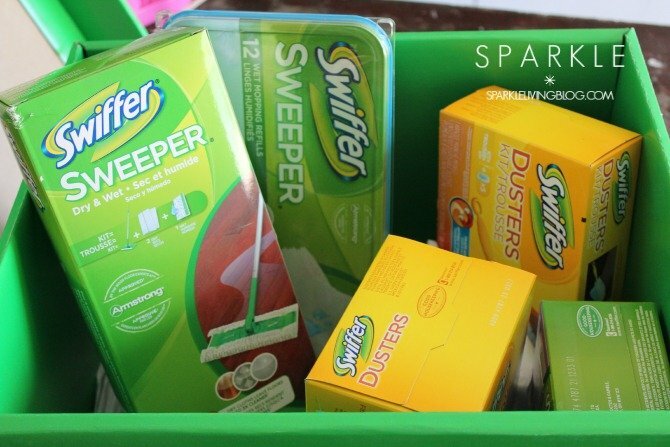 Swiffer products are a pet owners other “best friend” – they are safe for pets and actually make cleaning up after your pets quick and efficient so you can spend more time playing with your pet on the floor versus cleaning them. According to the Swiffer Cleaning Index, half of Americans say that concerns about pet hair and shedding in their home is one of the top reasons they worry about getting a pet, wouldn’t get a pet or don’t have one. More than one third (38 percent) of pet owners also say the leading source of “pet cleaning tensions” in their home is hair, dust bunnies and/or shedding. Whether you already have a pet or are considering a new one, Swiffer can help with the every day cleaning challenges. 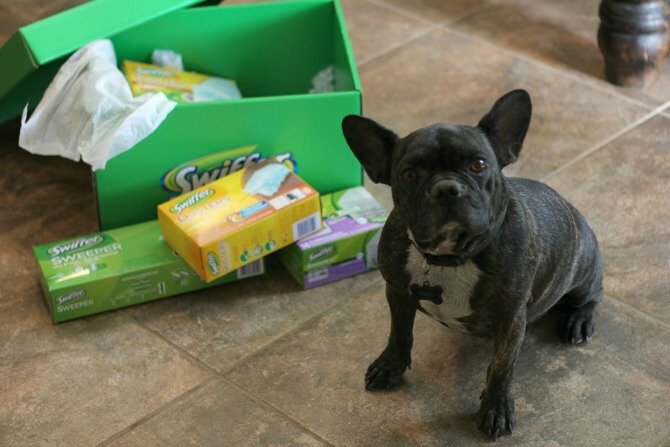 Swiffer® provided us with a second box to give to another animal lover in our lives. I surprised my friend Kristine, from The Pink Sprinkle with a giant green box! Those dogs are too cute!! Totally worth the mess, right? Our husky was so bad at shedding, that kit would have been a lifesaver. I’m so glad that Jonesy is doing well now. What a scary situation. Love the pic with the little dog in the Swiffer box..so cute. Looks like Swiffer makes things very easy for pet clean up…I should probably invest with a dog and black cat in the house!